Two Gigs at the Outhouse. Edinburgh, June 2016. The Playtime quartet dedicated one of their bi-monthly gigs to the music of Duke Ellington, and it was a pleasure, as I’d expected. Some tunes they played straight, but others were warped and twisted beyond recognition. They opened with C Jam Blues, which I didn’t realise until the closing notes. But they swung their hearts out, taking it very fast. They then played a tune I didn’t think I knew, Warm Valley, but a quick search on my iPod shows that I have five different versions of it! One if the problems of such a prolific artist as Ellington or maybe I have more music than I can listen to!). An excellent, straight forward version of Caravan followed, and a similarly straight Sophisticated Lady. They closed the first set with a radical dissection of It Don’t Mean A Thing. Slowed down, they took this in all sorts of directions, with a really different, almost abstract interpretation. This was creative and imaginative. To my ears it sounded like Mingus (who played with Ellington, both in the orchestra and in small groups, and who was greatly influenced by him), maybe bits of Mingus At Antibes (Prayer for Passive Resistance, I think). It was the first number of the evening which didn’t swing! They did the opposite to Come Sunday in the second half. The original is a slow, sometimes lugubrious piece: it is hard to give it the life it deserves. Whilst keeping the tempo of main melody, the drums and bass played double, maybe triple, time, turning it into a fast, almost bebop tune – as if Bird had played it. It must have been very hard to execute, especially for saxophonist Martin Kershaw. I’m not entirely sure it worked, but at least they didn’t drag! They also played In A Mellow Tone, Weary Blues (not strictly Ellington, but he and Johnny Hodges played it on the album Back to Back), and In A Sentimental Mood. All were just what one would have wanted. They closed with Take The A Train, Billy Strayhorn’s theme for the orchestra. 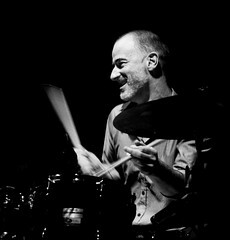 Tom Bancroft worked up a real shuffle on the drums, imitating a speeding locomotive. A great finish to a very enjoyable gig. But they only played ten numbers; I hope they’ll have to delve back into Ellington’s rich portfolio for another night or four! 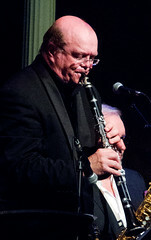 The following week, saxophonist and clarinetist John Burgess lead a quintet playing the music of W.C. Handy and Spencer Williams. This would have been a gig I’d previously run a mile from: early New Orleans jazz is way out of my normal listening. (And Handy was from Alabama, via Memphis, Shi that’s probably wrong of me anyway.) But that’s actually why I thought I’d give it a go: it’d be different, and even if I didn’t enjoy, I’d learn something. I did learn something. I learned I enjoyed it a lot. I learned that good music is good music. I was slightly more familiar with Handy, but I hadn’t heard of Spencer Williams before, whose music featured in the first set. It turned out I had actually heard his music, though. He wrote Basin Street Blues and Royal Garden Blues, both long term jazz standards. I’ve got versions of both of them by Ellington, for instance. Other numbers were familiar, too. W.C. Handy is possibly best known for the classic St Louis Blues – also recorded by Ellington (and many others); the version I know best is Gil Evans’ arrangement on New Bottle, Old Wine, though Evans didn’t change much – a lot of the Gershwin-like touches are there in early versions of the tune, too. Burgess opened the second set with this, maybe to get the hit out of the way early. Handy wrote many other standards. Burgess played several of them – Memphis Blues, Beale Street Blues, Ole Miss Rag. It would be wrong to call the music authentic: it was made by modern musicians on modern instruments for modern ears, and long long way from Memphis and New Orleans. But it seemed to be played without taking too many liberties. And it was very enjoyable. What I kept thinking about was the age of this music. All the tunes the band played were originally written around one hundred years ago. That’s not very long in the scheme of things. Jazz has changed immeasurably – gone of in all sorts of directions. But the music Burgess played was definitely, recognisably jazz. It’s like it’s come a long way in a short time, but at the same time hasn’t changed much either. This entry was posted in Jazz and tagged Duke Ellington, John Burgess, Mario Caribe, Martin Kershaw, Playtime, The Outhouse, Tom Bancroft on June 29, 2016 by patrickhadfield. SNJO Play “The Jazz Genius of Billy Strayhorn”. Edinburgh, February 2015. I have seen the SNJO play many times since they started twenty years ago. I like what they do. And I love the music of Billy Strayhorn. So they would have tried very, very hard for me not to enjoy this gig. Fortunately, that didn’t happen. Though they did work hard, it was a joy. Working from Strayhorn’s original charts – and including many recently found tunes and scraps of tunes – and covering the whole of Strayhorn’s career to celebrate the centenary of his birth, this was the SNJO in repertory mode. They started with “Take the A Train”, the first of Strayhorn’s charts for Duke Ellington, a more restrained performance than their concert of Ellington numbers a while ago, and over the course of two long (but two short!) sets took us through to Strayhorn’s last composition, “Blood Count”, written when he was having treatment for leukaemia (and recorded after his death on Ellington’s memorial to Strayhorn, “…And His Mother Called Him Bill”). “Blood Count” was beautifully elegaic. The playing was subtle and refined, the charts leaving little space for extravagant histrionic solos. 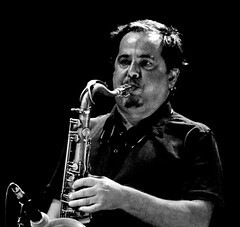 At times it seemed like the band were channelling the greats from Ellington’s bands: altoist Paul Towndrow had Johnny Hodges’ tone down to a tee, trumpeter Tom McNiven stretching for Cat Anderson’s high notes and, had I been listening with my eyes closed, I would have sworn the clarinet was coming from Jimmy Hamilton rather than Martin Kershaw. With Kershaw leading on clarinet he had to double on tenor, and the second alto was filled unusually by Konrad Wiszniewski, leaving Tommy Smith as the only lead tenor player. He naturally filled that role perfectly, with beautiful solos on “Isfahan” (played as a duet with Brian Kellock on piano) and “Lush Life”. SNJO have got a busy year ahead as they celebrate their twentieth anniversary. with Kurt Elling singing Sinatra in May, a June tour of the Highlands & Island with Eddi Reader (I have half a mind to catch them in Ullapool…) and autumn tours featuring firstly the music of Benny Golson and secondly Glenn Miller. I wonder if they do requests? This entry was posted in Jazz and tagged Billy Strayhorn, Duke Ellington, Martin Kershaw, Paul Towndrow, SNJO, The Queen's Hall, Tommy Smith on March 1, 2015 by patrickhadfield. Edinburgh Jazz Festival. July 2013. July’s Jazz Festival was understandably busy. Ten gigs in ten days, with a couple of extra, excellent outdoor events, too. It was a fun time. I tried to balance newer and old music, musicians I knew (and knew I liked) with people I’d not heard before; and a range of styles and groups. I won’t cover every gig I went to, but I’d like to cover those that worked well, or didn’t. 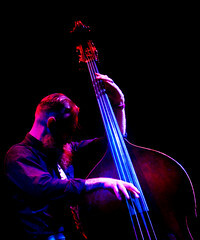 The festival opened fire with the Brian Kellock Copenhagen Trio. 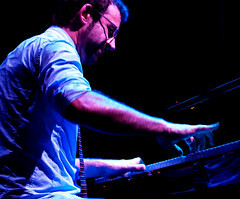 Kellock is a great pianist, with a chimeric skill in mixing genres and styles whilst presenting an engaging whole. 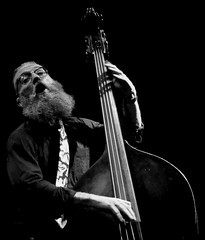 His music twists and turns as he moves from stride to Monk and references more modern, keeping the bass and drums in their toes – and there was clearly a fair bit of joshing going on between the three of them. 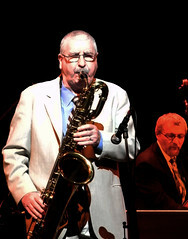 Kellock filled some very big shoes when, a few days later, he took the place of Stan Tracey, who had pulled out of his quartet gig with Bobby Wellins due to illness. So it became the Wellins Quartet, with Clark Tracey on drums and Andrew Cleyndert on bass. This was a fun gig, but Kellock seemed subdued – at least compared to his form earlier in the festival – and it felt a bit as if the band were going through the motions. Good, but not outstanding. The festival was beset with illness, losing the last night headliner Pharoah Sanders as well as Tracey. This was a big disappointment, since Sanders is one of the remaining firebrands from the 1960s avant garde, and not having seen him live for many years I had been looking forward to seeing how he had settled into life as an elder statesman. The Italian/Sardinian-Scottish connection in Stone Islands had been forged at last year’s festival, when Scots trumpet Colin Steele and pianist Dave Milligan teamed up with reedsman Enzo Favata. That was one of the surprise hits last year, and their return with an extended band this year was eagerly awaited. My expectations worked against them, since I thought they were excellent, but I was still disappointed! Tinged with a folk feel and featuring saxophonists Martin Kershaw and Konrad Wisniewzski, this ten piece had some of the anarchy of Chris McGregor’s Brotherhood of Breath. They made a great sound, but didn’t quite capture the magic or excitement of last year’s debut. 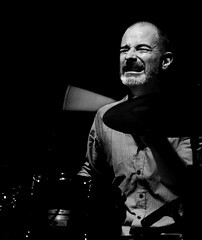 Despite the familiarity of a band I had seen four or five times in the last year, the Neil Cowley Trio put on such a high energy show that they couldn’t fail to excite. Very much a band, each member is integral to the sound, from Evan Jenkins’ powerhouse drumming, through metronomic Rex Horan’s bass playing to Cowley’s passionate piano. Their tunes move from subtle to intense to loud, and they do it all very well. This was just a superb gig, the power of a rock band with the intricacy and emotion of – well, a jazz trio. They were just beaten as highlight of the festival by the Festival Orchestra’s performance of Duke Ellington’s Concert of Sacred Music. I had mixed feelings ahead of this gig. It was a must-see because it was a rare opportunity to here this music played live; but I was worried it would just be played note for note. And the involvement of a classical choir meant it might not sound like jazz at all. The Ellington recordings of his sacred music can feel like a missed opportunity, a little bit too sacred. This gig was, however, a joy from beginning to end. Directed by Clark Tracey, the band and choir swung like the clappers, the Scottish Chamber Orchestra Chorus clearly enjoying the added freedom from their more usual classical constraints. 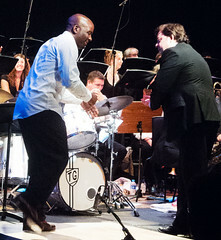 Joined for several numbers by dancer Junior Laniyan, whose own percussive take added to the driving drums of Tom Gordon, the band were magnificent. The whole gig was like a hymn to Ellington and an earlier age. Absolutely wonderful. 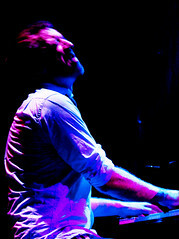 This entry was posted in Jazz and tagged Bobby Wellins, Brian Kellock, Clark Tracey, Colin Steele, Dave Milligan, Duke Ellington, EJF, Enza Favata, Evan Jenkins, Junior Laniyan, Konrad Wiszniewski, Martin Kershaw, Neil Cowley, Pharoah Sanders, Rex Horan, Stan Tracey, Tom Gordon on September 20, 2013 by patrickhadfield. Bach to Bite. October-November 2012. At the end of October and the beginning of November, it felt like I was practically living at the Queens Hall: I went to four concerts there in two weeks. First up were two jazz gigs: Scottish National Jazz Orchestra played a concert of Ellington pieces, and a week later I saw Tommy Smith’s Karma. (Smith is also director of SNJO.) The Ellington gig started off a bit delicately, as if the repertoire was more important: it felt very much like they were reading rather than playing, the dots being a bit precious. But they stretched out at the end of the first set with a great version of “Rockin’ in Rhythm” which laid the foundations for a roaring second set. They played tunes from the whole of Ellington’s (and Strayhorn’s) career – from “Harlem Airshaft” through to some tunes from The Queen’s Suite, the Nutcracker Suite and the Peer Gynt Suite. “Single Petal of A Rose”, from the Queen’s Suite, was a gorgeous duet between Smith and Brian Kellock, pianist for the night (who was on great form all night). They closed the second set with storming “Diminuendo and Crescendo in Blue”, with Smith blowing chorus after chorus in the role made famous by Paul Gonsalves. 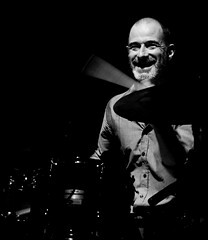 I last saw Smith’s Karma quartet in last year’s London Jazz Festival when they played a single, truncated set. I had felt a bit ambivalent about the band, so the opportunity of seeing them play a full gig seemed interesting. I am still ambivalent: the playing was superb, particularly Steve Hamilton on keyboards, but every time they got going, the rhythm or the tempo would change. It felt like 1980s prog, as if they couldn’t let their playing alone long enough to get on with the music. Very fiddly. A few days later, Angela Hewitt played a concert of solo piano pieces by Bach. The second half was taken up with (I think) twelve pieces from The Art of Fugue. It was exquisitely beautiful and at times quite jazzy, but despite Ms Hewitt explaining that bits were improvised, it also felt formulaic – inasmuch as it was clear what would happen next. Programmed music, perhaps. The last concert of my self-curated series was perhaps the most interesting, and certainly the (erm) wackiest. 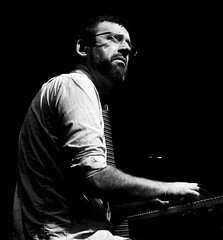 I have been aware of Matthew Herbert‘s role as a big band composer for a long time, though I only have one of his recordings, and he has recently got a new job, so when I saw his show “One Pig was coming to Edinburgh, I knew I wanted to see it. It was – well, hard to describe. Musically, the nearest experience I have to it was a concert of “industrial music” created by chainsaws and sledgehammers that I saw in one of Edinburgh’s cathedrals about 30 years ago. (It might have been Test Dept; which, I read, were founded by Alistair Farquharr, who went on the form NVA who produced “Speed of Light“. A definite feeling of connectedness…) “One Pig” was music, but of a strange, different kind. It was even danceable, but – well, noise. There wasn’t much to look at: a drummer sitting at a kit of electronic drum pads (Tom Skinner, who I’d seen playing avant garde jazz before), an electronic keyboard player, and two people (including Herbert) operating computers. 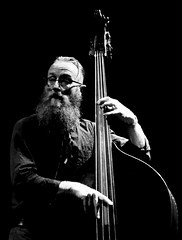 The fifth member, Yann Seznec, stood in the middle of the stage enclosed within what looked like a boxing ring: this was what Herbert called the “sty-harp“, created by Seznec. (This post describes how you could make one of your own.) Seznec pulled on the strings to interact with the sounds: much of the sound in “One Pig” was sampled from the pig; its bones used to make percussion instruments, its skin used as the head of a drum. The sty-harp as well as the computers and samplers operated by Herbert changed the sounds coming from other sources – the drums and the keyboard. It was difficult to tell what was actually making the noises – there was little to connect the musicians’ actions to the sounds they created. Towards the end of the piece, a chef appeared behind the musicians and started to cook some pork (not the one pig, I hope – that was slaughtered some months ago), the sounds from the frying pan sampled and used in the music. But the strangest effect came at the end: the noises stopped and Herbert sang a simple song, accompanied by an untreated piano. It was startling and jarring. A most curious concert. 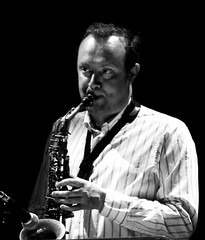 This entry was posted in Jazz, Music and tagged Alyn Cosker, Angela Hewitt, Brian Kellock, Duke Ellington, Matthew Herbert, SNJO, Steve Hamilton, The Queen's Hall, Tommy Smith, Yann Seznec on December 27, 2012 by patrickhadfield. 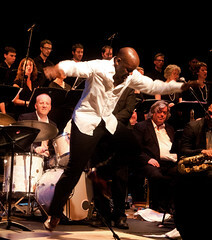 Edinburgh Jazz Festival: Big Bands. July 2012. I thought it was a pretty good festival this year: ten gigs in ten evenings, and only one which I didn’t really rate – most of the gigs were excellent, and one superlative that I’ll be very lucky if it isn’t my “gig of the year”; a mixture of local talent and international stars; small bands and big bands; and a range of styles. The two big bands I saw were playing from the repertoire and, I think, both were essentially one-off projects for the festival – at least, neither seems to have much presence outside the festival. The first up was the Edinburgh Jazz Festival Orchestra, playing the music of Gil Evans. The third such gig in a year (after Mark Lockheart’s leading the Trinity Laban Contemporary Jazz Ensemble in the music from “Out of the Cool” and, on Gil’s one hundredth birthday, his son Miles playing first trumpet with the London Jazz Orchestra performing music from “Miles Ahead”) – all of which were wonderful gigs, not least because it is just such a pleasure to hear music familiar through recordings played live. 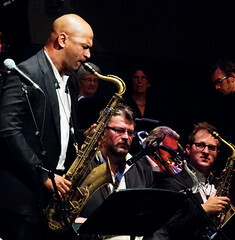 The Edinburgh Festival Jazz Orchestra, lead by Tim Hagans, had wanted to play Evans’ “The Individualism of Gil Evans”, but they couldn’t source the charts – instead they played a first set of Evans’ early work – arrangements of bebop tunes for Claude Thornhill, mostly – and a glorious second set of “Sketches of Spain”, complete, with Hagans taking the lead trumpet part. It was a pleasure all the way – the music sounded fresh and vibrant, the orchestra bringing the music alive. The second big band was the World Jazz Orchestra under local boy Joe Temperley playing the music of Duke Ellington. And, in his slipstream, Billy Strayhorn, too. Temperley also had some problems with the charts – they hadn’t made it across the Atlantic (along with his suit and his wife!). This meant that the band leaned on standards more than they had anticipated – though Ellington produced enough of those. For the first couple of numbers it seemed as if they were coasting somewhat, and it wasn’t clear what Temperley was bringing to the bandstand. But then he started playing – mellifluous baritone sax and bass clarinet – and it all clicked: his reeds made all the difference. The highlight was a gorgeous version of “Single Petal of a Rose” – quite magical. This entry was posted in Jazz and tagged Duke Ellington, EJF, Gil Evans, Joe Temperley, The Festival Theatre, The Queen's Hall, Tim Hagans on September 6, 2012 by patrickhadfield. Ellingtonia: Stan Tracey Big Band and Tomorrow’s Warriors Jazz Orchestra. London, July 2009. In the space of a week, I went to two excellent concerts featuring suites of pure Ellingtonia. First off, last Saturday I went to see the Stan Tracey Big Band playing Tracey’s Genesis Suite, a late night jazz Prom at the Royal Albert Hall. I heard Tracey’s band play this way back in the 80s, I’ve heard it (and recorded it) on the radio, and I bought the CD – it is one of my favourite peices of music. I probably heard it before I was into Ellington – certainly listening to Stan Tracey helped me make connections between the modern jazz I was listening to and the rich music of Ellington. The suite takes Ellingtonian forms and adds a modernist slant, creating wonderful music. It wasn’t wholly successful as a Prom. Whilst the music was excellent, the sound was pretty lousy, and the audience diminuitive: only about 10% full, we rattled around the hall, largely devoid of atmosphere. 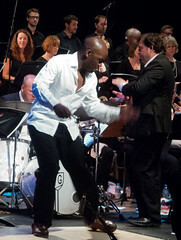 I have been to several jazz Proms over the years – Loose Tubes, Wynton Marsalis’ Jazz at the Lincoln Centre, a couple of others – and I am never sure that either the BBC or the Albert Hall know how to integrate jazz into the Proms. That the sound was so poor is frankly shocking: despite the big band being – well, big – it had no penetration: it sounded weak. The solists were properly miked and their sound came across, but frankly a band like that should have had a punch, and they didn’t. And where was everyone? This was a chance to see and hear one of the grandees of British jazz performing a lively, complex, exciting piece of music. It should have sold out! As it was, the prommers were clustered around the stage and I had 15 empty stalls seats on each side of me. The audience was very appreciative, but we couldn’t fill the vast space. The music though was excellent: it felt very exciting to hear the Genesis Suite live once more. Tracey played with passion and energy; and the band were good – the suite fits its musicians. But it didn’t really work in the Albert Hall. Then on Friday I went to see Tomorrow’s Warriors Jazz Orchestra at another big concert hall, the Queen Elizabeth Hall on the South Bank. I only found out about the gig on Friday morning; it was part of a whole day of free activities that Tomorrow’s Warriors were doing on the South Bank. I caught a few minutes of a rehearsal by a band comprising young schoolchildren when I went to pick up a ticket for the evening show; at a very young age, these kids were frightenly good on their instruments – give them another 20 years and they’ll be the best of jazz. But actually, I think it’s because it was very, very good. The music started with a trio number backing Lem Sissay reading from Ellington’s autobiography, Music Is My Mistress – a section about Ellington’s passion for music. Personally, I wanted more music and less Sissay. Then the band played pianist Peter Edwards‘ suite, Above and Beyond the Horizon. I’d not come across Edwards before, but his playing and composing were excellent. His suite was full of Ellingtonian flourishes and homage; it was simulatanously respectful and modern. The band were very good, swinging when they needed to, creating mayhem in the free sections, and producing some great solos. The second half was preceded by Lem Sissay and more of Ellington’s writing – his feelings on nature, this time – and then they played the Queen’s Suite. It was an immense pleasure to hear this music live, played by a full jazz orchestra. 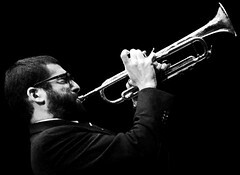 Edwards directed the orchestra – all fifteen of them – as well as playing piano, though they seemed to get by reading the dots pretty well… All sections of the band seemed really up for it – I loved the trumpets, lead by Abram Wilson – and the reeds were pretty good: there was some gorgeous, melliferous bass clarinet. Andy Chapman was excellent on drums. And Gary Crosby’s bass held it all together – though it was clearly his night (he got a roaring reception from the audience), his playing was subtle and understated. The sound was excellent, filling the hall, and the audience responded very warmly – I think there were a lot of friends in on Friday night! There was one other thing I noticed. When I used to see the Jazz Warriors back in the 80s – several times (including some of the most memorable gigs I’ve been to!) – all the band’s members were black. It had grown out of an education programme promoting back culture: this was the early 80s, there had been race riots around the country and Lord Scarman wrote long and worthy report about what should be done. British jazz felt segregated: it was uncomfortable. There were the Jazz Warriors at the forefront of black jazz, and the very white, witty, intellectual Loose Tubes. There didn’t seem to be much mixing until the 90s, when, for instance, Andy Sheppard used members from both bands in his Soft on the Inside big band. The reborn Brotherhood of Breath did the same. The Tomorrow’s Warriors Jazz Orchestra was neither black nor white: it wasn’t a black band, it wasn’t a white band: it was a band. And a very good one. They said that they had a residency at the South Bank Centre in the autumn. I shall certainly be back. And I am very, very pleased I had the opportunity to see them play some wonderful music this week, too. This entry was posted in Jazz and tagged Abram Wilson, Andy Chapman, Duke Ellington, Gary Crosby, Peter Edwards, Queen Elizabeth Hall, Royal Albert Hall, Stan Tracey on July 26, 2009 by patrickhadfield. Yesterday, my brother, my aunt and I were picking music for my mother’s funeral. She really liked Duke Ellington – it kind of runs in the family (although maybe it just runs in people that like music? ), and for my father’s funeral (twenty years ago), she had In A Sentimental Mood played. So we thought we’d go for some Ellington, and if we had found a decent version of In A Sentimental Mood played by Ellington, we’d probably have picked that. (I have seven recordings of In A Sentimental Mood on my iPod; but none of them are by Ellington! My favourite is by Michel Petrucciani – not this version, but close…). There are two versions of Lotus Blossom on that recording, one solo and one alternate take with Johnny Hodges joining in at the end. It was the last one we decided we wanted. I have just had a phone call from my brother; he was clearing out my mother’s desk, and he found a scribbled note that said “Duke Ellington Lotus Blossom – alternate take”. We reckoned she must have been listening to the radio, heard it, and made a note of it. It is rather nice to have got that right! This entry was posted in Jazz, Music and tagged celebration, Duke Ellington, funeral, Michel Petrucciani on September 28, 2008 by patrickhadfield.